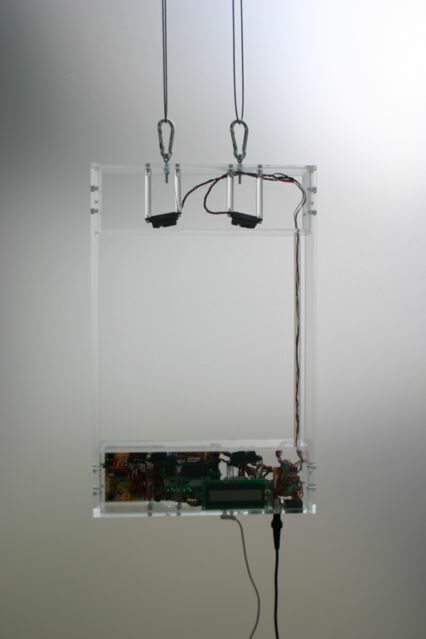 The talking machine k2.1 will be shown at Kinetica Art Fair 2009 in London! Carnivorous lampshades, pole dancing robots, man-animal-machine hybrids, mechanical writing machines, subliminal and sensitive installations, mesmerising light sculptures and cybernetics are just some of the incredible exhibits at Kinetica Art Fair, the UK’s first art fair dedicated to kinetic, robotic, sound, light and time-based art, that opens in London on Friday 27 February with a dance-light spectacular. More than 25 galleries and organisations specialising in kinetic, electronic and new media art are taking part and over 150 artists are exhibiting. The Fair will be like no other with ‘living’ artwork moving, speaking and performing. The Fair provides unparalleled opportunities for the public and collectors alike to view and buy work from this thriving international movement, and to participate in talks, workshops and performances. • Opening spectacular and world premiere: Friday 27 February, 20:00 – 22:00hrs, artist Seth Riskin, a former U.S. national champion gymnast, brings his astonishing physical ability to Light Dance in which he sculpts light and space in a remarkable performance of human and light interaction. Acclaimed international artist collective, Body>>Data>>Space, presents a world premiere where performers interact with light, laser and visual projections. Other performances are detailed below. • Where: P3, 35 Marylebone Rd, opposite Baker Street Tube. P3 is London’s newest multi-disciplinary art space. The 14,000sq ft former concrete testing facility is located under Westminster University. Posted on 18. February 2009 by audiocommander. This entry was posted in Articles in English, Arts/Kunst and tagged Exhibition, Interactive, Kempelen, kII, Kinetica, London, Medienkunst, Microchip, midibox, Phonetic, SpeakJet, Speech, Sprechautomat. Bookmark the permalink.